Tokyo, Oct 23 (IANS) Japan’s ruling camp grouped by Prime Minister Shinzo Abe’s Liberal Democratic Party (LDP) and its junior partner, the Komeito Party, has won a two-thirds “super majority” in Sunday’s lower house election, according to vote counting results reported by public broadcaster NHK. As of 01.50 a.m. on Monday, the LDP has secured 283 seats of the 465-seat lower house of parliament and the Komeito Party has won 29 seats, while there were still 10 seats undecided with vote counting still going on, according to NHK. The ruling camp taking two-thirds majority in lower house would pave the way for the prime minister to realize his long-term ambition of revising the postwar pacifist constitution, local analysts said. 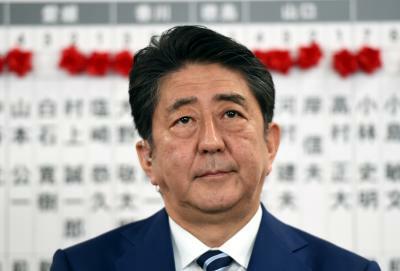 “I want to accept this victory with humility,” Abe told a television program after the election on Sunday. He added that he expects “discussions on revising the constitution to deepen” in the parliament in an attempt to seek more support from various forces on the issue. Meanwhile, the “reform conservative” Party of Hope led by Tokyo Governor Yuriko Koike and the Constitutional Democratic Party of Japan (CDPJ) are vying for the largest opposition. 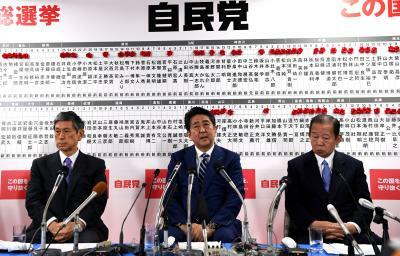 The Party of Hope, while sharing the LDP’s conservative views on constitutional change and security laws, has been against consumption tax hike and criticized Abe’s economic policies dubbed Abenomics. The CDPJ, set up only about a couple of weeks ago by the collapsing Democratic Party’s liberal wing, was quick to rise after voters’ initial enthusiasm for the Party of Hope ebbed. Yoshihiko Noda, former prime minister, said that the opposition forces should have been able to win more seats with support rating for Abe’s cabinet dropping amid scandals, but the splitting-up of the opposition benefited the ruling camp. Voter turnout was expected to be around 53.60 percent, slightly higher than the record low of 52.66 percent for the previous lower house election in 2014, according to a NHK projection. A powerful typhoon approaching the Japanese archipelago, bringing rain and strong winds and disrupting traffic, was expected to weigh on the turnout, but a record high of 21 million people, or around 20.1 percent of the eligible population, have cast their ballots early. Due to the typhoon, regional election boards of some municipalities have announced that ballots counting in those areas could be delayed to Monday.